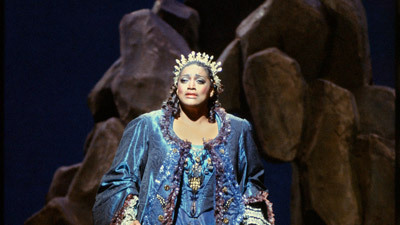 The great Jessye Norman is Ariadne, the mythological heroine abandoned by her lover on the island of Naxos. 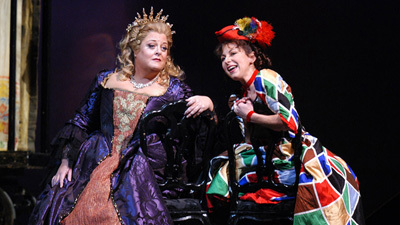 In Strauss and Hofmannsthal’s charming opera-within-an-opera, she is joined by Ruth Ann Swenson as Zerbinetta, the flirtatious leader of a commedia dell’arte troupe that—by order of an eccentric patron—unexpectedly finds itself in the middle of Ariadne’s tragic story.Thomas Moser sings Bacchus, the young god who wins Ariadne, and Susanne Mentzer is the Composer of the fictional opera. Wagnerian bass-baritone Thomas Stewart makes a late-career cameo appearance as the Music Master.